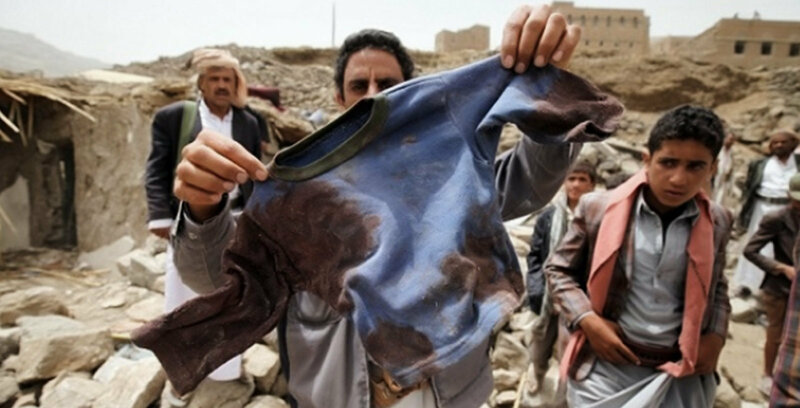 The US-backed Saudi coalition committed on Tuesday, December the 4th, various war crimes and violations by conducting air raids and bombardments in a number of provinces, leaving killed, wounded civilians and material damage in public and private property. In Hodeidah coastal province, West of Yemen, a little girl was killed while the rest of her family were injured as a result on intensive ground shelling of the city of Durayhmi, where local source reported that the mercenaries fighting for the coalition had shelled the town of Durayhmi with more than 50 Katyusha rockets. Moreover, in Hodeidah, Saudi warplanes carried out a raid north of the al-Shabab city on 90th Street and struck a building in al-Katheeb area near al-Rabia Park in the al-Mina’a district. In the province of Saada, Saudi-led coalition military aircraft targeted the property of citizens in the district of Baqem, in addition to shelling villages with rockets and artillery shelling in the district of Munebah. In Sana’a province, the coalition launched five raids on the Garban district of Sanhan governorate, a raid on the maintenance camp in the center of the capital, and 12 raids on the district of Nehm. In Yemen’s Lahj, mercenaries affiliated with the Saudi-led coalition targeted several houses of citizens within the village of Thabra in al-Shuriha area by artilleries ground shelling, which led to the start of fire on a number of houses.